Professor of Philosophy Mark Okrent gets a close look as board chairman Mike Bonney ’80 (left) and President Nancy Cable do the ribbon cutting. Photograph by Rene Minnis. The journey of Paul Marks ’83 from Bates to China, and from being “a fairly unengaged student” to an international business leader, made an ideal narrative for the ceremonial reopening of Roger Williams and Hedge halls, facilities newly repurposed for the academic exploration of border crossings — borders national, cultural, philosophical, spiritual, disciplinary. Now based in Shanghai and CEO of the global aerospace technology firm Argosy Inc., Marks was one of Bates’ first students to graduate with a China-focused history major. His address at the dedication ceremony recounted how a Short Term trip to China in 1981, 30 years ago this year, was the challenge that set him on his life’s path. Remarks by Bates board chair Michael Bonney ’80, college President Nancy Cable and Student Government President Cosmin Ghita ’12 were also on the program for the dedication late Thursday afternoon. 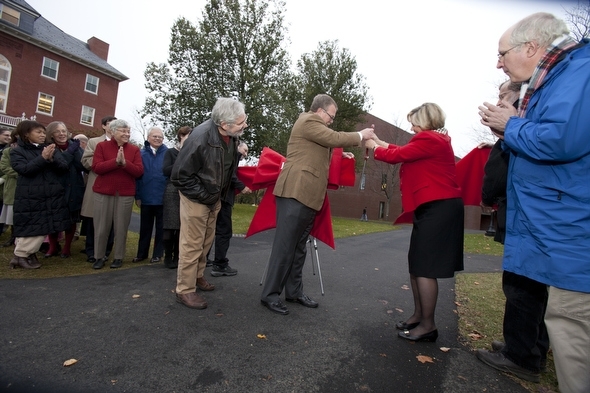 Two symbolic acts completed the ceremony, as the faculty and staff who are the buildings’ stakeholders received honorary keys to Hedge and the Bill, and a ribbon-cutting made their reopening official. Paul Marks ’83 speaks to the dedication audience about his defining experience in China in 1981. Photograph by Rene Minnis. As Marks recalled, his parents were not thrilled about the notion of his going to China. It took the persuasive powers of Professor of Sociology George Fetter, who had arranged Bates’ first-ever Short Term expedition to China two years previous, to bring them around. Part of the attraction was a spur to his competitive spirit from the group’s Chinese guide, who insisted that the foreigners couldn’t learn the language. Marks rose to the challenge, betting the guide five bucks that he could indeed learn Mandarin. With his first instructor at Bates an adjunct faculty member who was the wife of a local Taiwanese dentist, Marks became Bates’ first student of the Chinese language, and continued his studies as a postgraduate. 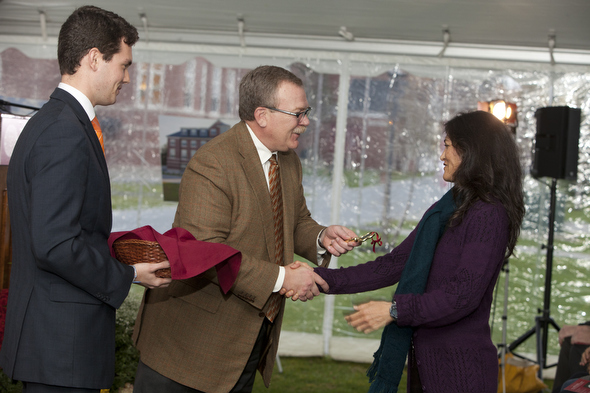 Board chair Mike Bonney presents a symbolic key to Roger Williams Hall to Spanish professor Claudia Aburto Guzmán. Photograph by Rene Minnis. 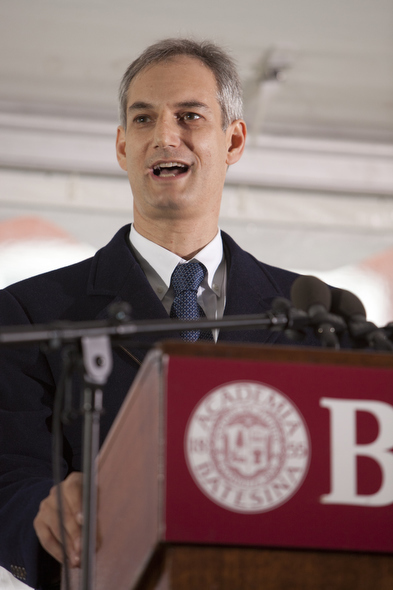 “These two academic buildings, and the campus at large, are powered by Bates faculty,” Cable told the 175 or so listeners gathered in a tent on Alumni Walk, near the Bill and Hedge. “It is the faculty’s attention to the individual that makes the Bates experience so vitally special and distinctive academically. The ceremony began with international students Mustafa Basij-Rasikh ’12 of Kabul, Afghanistan, and Romina Istratii ’12 of Athens, Greece, welcoming the Bates community in their native languages (Istratii, anticipating Marks’ subject, also offered a greeting in Chinese, which she is studying at Bates).